Skills and abilities: Talented street fighter and brawler. Genecide is also an inherent leader. Powers: The nature of her abilities are unknown, is she a mutant? Inhuman or meta-human? Her powers allow her to see the genetic composition of those around her. She claims that she can see “every dominant trait, every recessive gene and every minor mutation”. Not only can she see it but she can interpret what they mean. Genecide can also manipulate her own genetic structure allowing her to heal herself instantaneously, shape shift, fire concussive force beams, generate heat and enhance her strength and reflexes. The full scope of her powers however remains a closely guarded secret. Equipment: She wears a fair bit of metallic armor over her torso and also employs other gadgets. 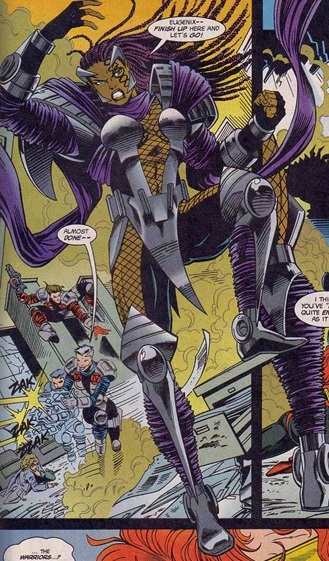 The woman known only as Genecide made her debut as a villain battling the New Warriors [New Warriors #63]. During her first appearance she lead a band of terrorists called the Eugenix. Due to her powers she can “see” the genetic make-up of people and is able to interpret what every dominant trait, recessive gene, and any minor mutation means. Perhaps because of her abilities she feels it is her divine calling to kill/sterilize those she deems unfit to procreate because of these defects and kill those who drain society’s resources just by their continued living [New Warriors v2 #1]. She makes her debut attacking a clinic owned by the Taylor foundation, but the superhero Firestar is present.At first Genecide is fascinated with the young mutant thanks to her training from the Hellfire club and her microwave abilities. Easily capable of overwhelming the young woman her plans are put on hold when the Psionix arrive lead by Night Thrasher [New Warriors #63]. The resulting battle finds Genecide and her team overwhelmed especially when the New Warriors arrive [New Warriors #64]. She takes a doctor hostage and survives a gunshot to the neck inflicted by Night Thrasher.Before making her escape she revealed that NIghtThrasher was not truly human and revealed that Firestar’s powers were slowly killing her [New Warriors #64]. Years later Genecide decides its time to go public once more, this time to take down Namorita because of her clone status [New Warriors v2 #1]. She takes on the form of Namorita’s doctor and confronts her. Before they can kill her however she summons the New Warriors. Realizing strange genetic evolution in the clone she decides to not kill her but instead offer her the answers she so clearly desires. At first Namorita is tempted but she ultimately rejects the offer when Genecide starts destroying the clones in the facility. She again evades capture and escapes [New Warriors v2 #1].